In writing our PDF to Android PDF Viewer application I needed to ensure the source files we output are correct and work in popular IDEs with minimum fuss. This is what lead me to discover a little gotcha in Windows to do with how Java installs itself and what version you may be running in some situations. 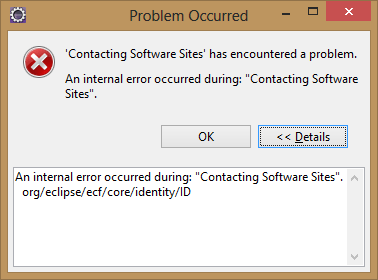 An internal error occurred during: “Contacting Software Sites”. Upon attempting to Install New Software. Even though my PATH variable and JAVA_HOME were pointing at C:\Program Files\Java\jdk1.7.0_11\bin and C:\Program Files\Java\jdk1.7.0_11 respectively. Upon a quick Google search using the correct keywords I came across a stack overflow question that was related to my experience from 2011 (in fact I found two, but only one had useful answers). In it the person explained that the Java installer would copy several executable files to your system32 folder so that Java would run fine without being set in the PATH (personally I’d prefer it if the installer didn’t do this). They also stated that these copied executable files are never updated by Java’s auto updates (which may be changed now, although my files were not overwritten with the latest auto update) and recommended removing Java using the control panel and reinstalling with the latest version. Another person suggested replacing the files entirely. What I did instead was to simply remove the .exe files from my system32 folder and then run java -version again, and to my delight it now used the correct JDK from my PATH variable and Eclipse did not encounter the error message any more. I didn’t even have to open a new command line window. I’ve yet to encounter any bugs with my other Java based as they all appear to be using the correct PATH as well but I have the executables backed up just in case. This solves the problem without deleting any files. For the original stack overflow question I came across on this issue see here, it isn’t exactly related to my circumstance with JDK8 but does describe what’s going on quite well. Have you encountered any other odd bugs or gotchas with the Java installer on windows that you’d care to share?